Fraser fir wreaths are prized for their display of natural color and fresh scent of Christmas. They are handcrafted by our wreath makers in the Blue Ridge Mountains each season and sold throughout the country. We sell and ship wholesale Christmas wreaths and Fraser fir wreaths are usually the favored variety. Although, we do create and sell White Pine wreaths and mixed live Christmas wreaths. Wreaths are a versatile décor item. They are used in offices, hospital waiting rooms, schools, and homes. They adorn both outdoor windows and front doors, as well as interior locations throughout your home or office. 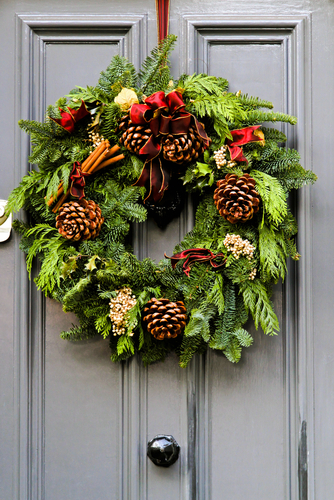 Small wreaths can be placed on office doors, on door handles and other locations. Larger wreaths are better used as a center piece either on the wall above the mantel, or centered in large windows of your home. To create a different pop of green color, you can even add twigs and small leaves from other trees and evergreens throughout your wreaths like this decorator did to this front door Fraser fir wreath. The base is a live Fraser fir wreath, and other fir needles and twigs have been weaved throughout. It appears the variety of needle used on top of the Fraser fir is Leyland Cypress. They’ve also used cinnamon sticks, ribbon and pine cones throughout. Fundraisers! Those that are looking to generate revenue from selling items this Christmas season should contact us. We work with churches, schools and other community organizations to provide Fraser fir wreaths and live Christmas trees at wholesale. They then take those and sell them across the country at their programs and fundraisers. 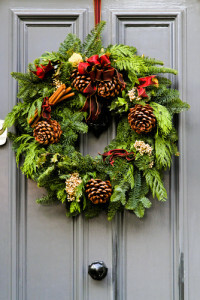 We have a great program for fundraisers that wish to buy wholesale Fraser fir wreaths grown in the Blue Ridge Mountains. Fraser fir wreaths are perfect au natural with no lights or other adornments placed on them. You literally can guy a real Fraser fir wreath bare, with nothing on it and place it on your door or window. It’s very easy décor to use. Still, others get creative and weave holly berries, miniature pine cones, fake snow, and other embellishments throughout their natural wreaths to create a different look. This is why they are such a versatile option to give as corporate gifts or hostess party favors. Fraser fir wreaths liven up any space.